I’m joining the MSM (mainstream media) boycott. But beside the fact that they print lies and blatant propaganda, i have another reason to wean off buying it. Our newspapers are basically crap. Let’s look at NST and the Star. Look, the local news about politics and stuff are not worth reading, besides, both papers tell the same story, different writer. As for the sports pages and international news, they all come from the same syndicated foreign news agencies. Unless you one of the 5 people who actually read local sports news, but let’s face it, the day Astro came on board with their live telecast of EPL and F1 and ATP tennis and endless golf tournaments, final nail went into the coffin of local sports. So the only way the papers can make an impact is in their lifestyle section and regional pullouts. In the Star, the former is called StarTwo and the latter (in Klang Valley) would be Star Metro (Their NST counterparts are “Totally Shite” and “I Couldn’t Care Less”). Here’s where the Star is miles better than NST, and this is the only portion most young people i know read in the papers. NST is utter shite in this department, i sincerely believe their writers can’t good and entertaining articles even if their lives depended on it. Just look at their comics section and their un-funny local strips. I’m all for supporting local talent, but not if they are so pathetic they insult our intelligence. And here’s another thing – RM1.50 is bloody expensive for a daily newspaper (Yes, the Star, I’m talking about YOU). Don’t give me the spin about rising paper prices and it still being the cheapest in the world, yadda yadda yadda. Look at the amount of advertising and the obscene rates you charge. The good thing is that as young people spend more time online reading blogs and social networking websites like facebook, the influence of MSM on them will be less and less. And with that, hopefully so will the advertising dollars also follow suit, and that would make the ultimate difference. we have also weaned off the papers when they started to charge RM1.50! 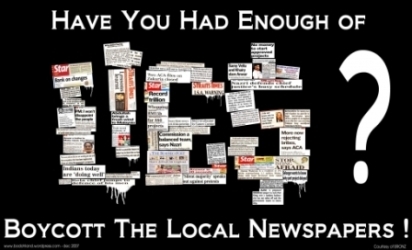 The only reason for the papers to me is to check for sales!So, I only get it when I intend to do some shopping! eyeris – but no more edison chen please. No, really. noktahHitam – join the boycott? Wow, Simon, strong words 🙂 But I have to agree with you about the state of our newspapers today. wow totally agree with you.